24 | TH E M R EP O RT FEATURE BEST IN ORIGINATION Waterstone Mortgage Corporation Supplementing with Big Data and Advanced Analytics D ata standardization becomes even more powerful when combined with big data and ad- vanced analytics. Consider the po- tential benefits. Advanced analyt- ics refers to "a broad category of inquiry that can be used to help drive changes and improvements in business practices," according to TechTarget. That last phrase is key—"drive changes and improve - ments in business practices" is a common objective across the housing finance industry today. To offer Day 1 Certainty, Fannie Mae combined big data and advanced analytics with data standardization to develop a new approach that allows for a move away from manual pro - cesses prevalent in the industry today—a clear business practice improvement. Data standardization and "big data" analytics are the key ingre - dients behind the DU ® validation service—another Day 1 Certainty offering. Leveraging standardized datasets enables a more accurate, simpler digital process. With elec - tronic validation of income, assets, and employment, lenders and their borrowers benefit by moving away from the manual processes prevalent in the industry today. Lenders are realizing meaning - ful savings with DU validation: • Pilot lenders who test-drove the DU validation service told Fannie Mae it shortened loan origination timelines by four to seven days (on average) with quicker preapprovals and meaningful time savings for loan processors, underwriters, and quality control teams. 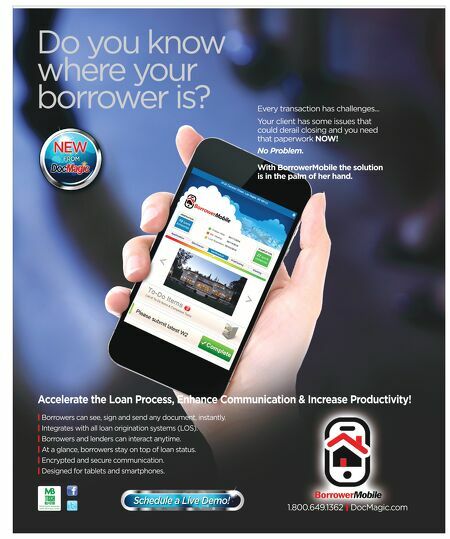 • One large nationwide lender recently reported significant efficiency gains: The average number of days from loan ap- plication to close was reduced by 50 percent. • A lender reported closing a refi- nance loan in 10 days from loan application using the DU vali- dation service and a Property Inspection Waiver. Lenders can be more efficient, give their borrowers a simpler ex- perience, and get Day 1 Certainty with freedom from representa- tions and warranties on validated loan components. The validation service is the newest innovative feature in DU. In 21 years, DU has come a very long way from that first soft- ware distributed on floppy disks. An early step forward was the ability to pull in credit reports using standardized data. And advanced modeling analytics that leverage characteristics of actual Fannie Mae loans power DU's increasingly sophisticated risk assessment. Embracing a New Menu F annie Mae's digital innovations are part of the larger industry digital journey. The mortgage in- dustry has taken key steps toward modernization and efficiency in the past seven or eight years, but we certainly haven't done it alone. Innovation by players in the industry or those serving multiple industries has been instrumental in making possible the indepen- dent third-party validation of mortgage borrower data. Data and tech pioneers have done criti- cal work—assembling big data- bases of employment and salary information; developing efficient yet secure ways to pull bank account and other asset informa- tion; building the infrastructure to support complicated integrations of lender, investor, and third-party systems—and much more. The mortgage industry may have lagged other types of fi- nancial services in adopting new technologies, but we are catching up. We have our own visionar- ies—they are lenders, service providers, and others. A Healthy Dose of Certainty T he Edelman Trust Barometer's 2017 sector report on trust in financial services shows an 11 percentage point increase in trust in financial services from 2012 to 2017—likely reflecting recovery from the financial crisis. But that trust level is still low. The Edelman Barometer shows trust in financial services at 54 percent while "technology" is one of the most trusted sectors, with 76 percent trust. So how to improve trust in fi - nancial services? Edelman says to "do things differently," and one of the recommendations is to "solve real problems with tech." The Edelman Barometer also looked at "financial products/services most in need of innovation or new ideas." In that category, "loans to support the purchase of a home" came in third with 31 percent (behind "education financing" and "financial support for small busi - nesses"). The time for innovation and new ideas to make home finance easier for everyone is now. The housing finance business is moving in the right direc - tion. Fannie Mae is definitely trying to do things differently to bring the mortgage industry up to date, make it easier for its lenders to originate and service mortgage loans, and help them give borrowers a better experi - ence. Fannie Mae looks forward to continuing its leadership role toward the industry's future vision. It's a central part of the company's quest to be America's most valued housing partner. ANDREW BON SALLE is EVP – Single-Family Business at Fannie Mae, a leading source of liquidity in the U.S. residential housing market. Reporting to the President and CEO, Bon Salle is responsible for all aspects of the single-family business, including engagement with customers, managing the performance of the credit portfolio, and overseeing all capital markets activities. Bon Salle also leads the company's efforts to integrate with the Common Securitization Platform. 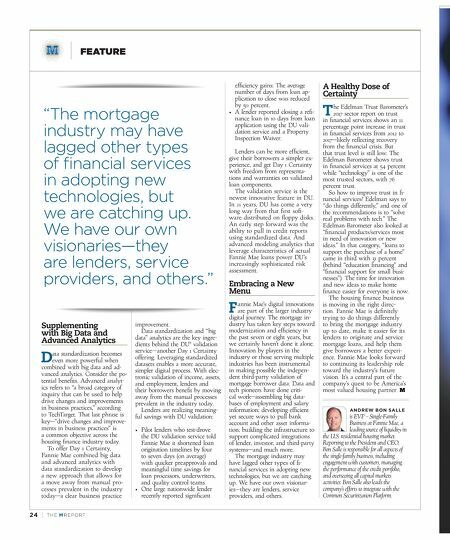 "The mortgage industry may have lagged other types of financial services in adopting new technologies, but we are catching up. We have our own visionaries—they are lenders, service providers, and others."